St. Peter's “church” is no longer in use but is open to the “public.” Originally constructed in the 1830s and survived the many Civil War battles fought in the area. The church was renovated in 1896, but the 44 hand-carved stone steps from High Street to the Church and Jefferson Rock were preserved. 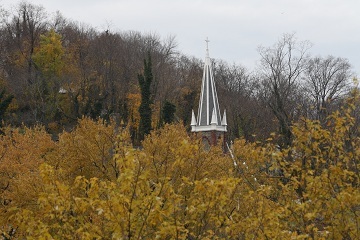 The church can be seen clearly on the walk up the stone steps to Jefferson Rock.